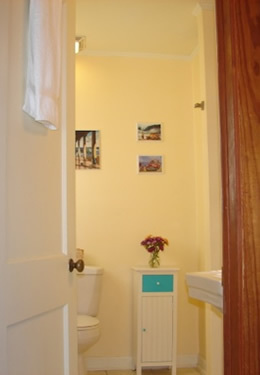 The Pineapple Room is our most popular deluxe queen room located on the second level of the bed and breakfast featuring our ocean “glimpse” view. 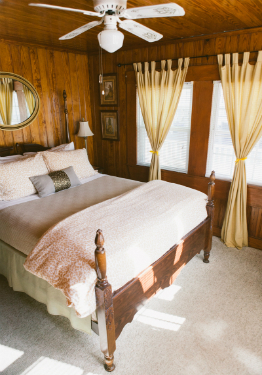 Closest to the upstairs porch where you can relax in one of our rocking chairs, this room is themed around the universal symbol of hospitality – pineapples – the room features a queen-size bed and 24 inch flat screen satellite TV. An “en-suite” private bathroom with a stand-up shower, Turkish towels, and premium linens completes this well-liked room. Cooled and heated by an individually controlled mini split, the room stays comfortable year around. Approximately 12’X10’, the Pineapple Room sleeps a maximum of two adults.